Taking apart HP Pavilion dv7. Guide 3. In this guide I’ll be taking apart a HP Pavilion dv7 laptop. 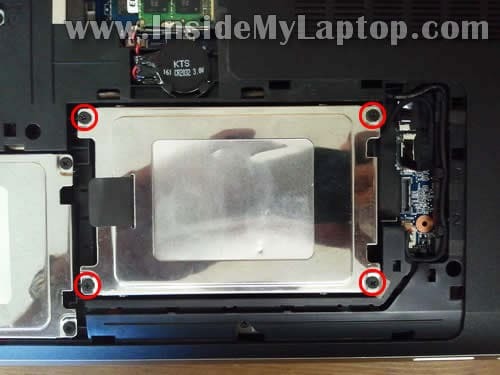 This is my THIRD disassembly guide for HP Pavilion dv7 series. 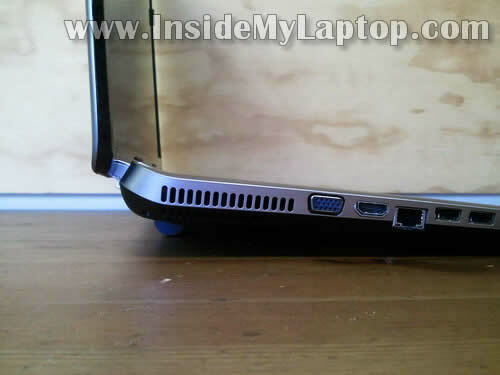 This guide was made for HP Pavilion dv7-6000 series. In this particular case I’m taking apart dv7-6113cl model. 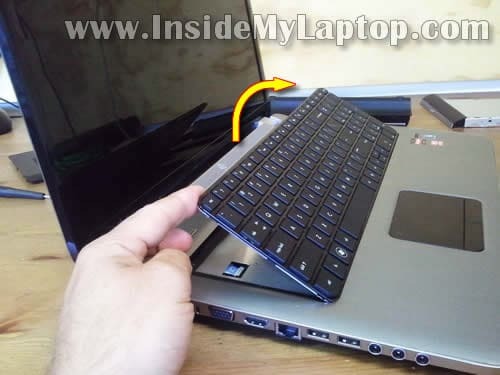 If your laptop looks like one shown on the following picture, this guide will work for you. At the end of the guide you’ll find links to other three dv7 models. STEP 1-9: Accessing both memory modules, wireless card, CMOS battery. Disconnecting the hard drive. STEP 10-16: Disconnecting and removing the keyboard. STEP 17-23: Removing the palmrest assembly. STEP 24-25: Accessing the DC power jack harness and cooling fan. OK, lets take it apart. First of all, make sure the computer is turned off. Slide the battery latch to the left (unlocked position). At the same time insert something under the bottom hatch and lift it up. Continue removing the hatch with your fingers. You’ll have to wiggle the hatch in order to remove it. – Primary and secondary (optional) hard drives. Remove four screws securing the primary hard drive mounting bracket. 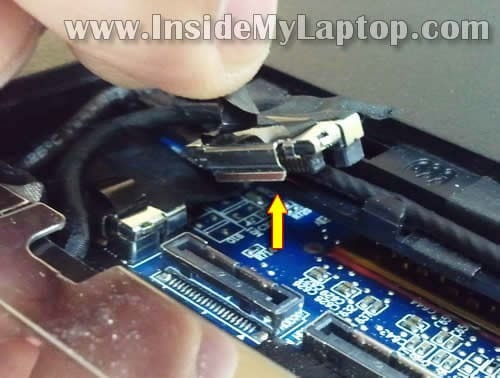 Disconnect the primary hard drive cable from the motherboard. Lift up and remove the primary hard drive assembly. In my HP Pavilion dv7 I didn’t have secondary hard dive installed. I had only an empty bracket. Remove one screw securing the keyboard. Now the tricky part to remove the keyboard. 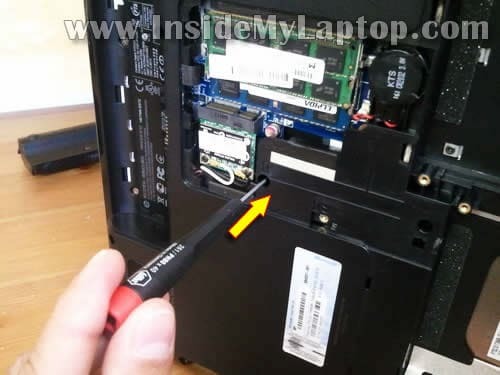 Insert a very small screwdriver into the whole where the keyboard screw was located. Push the screwdriver into the hole. By doing that you actually pushing on the back side of the keyboard. 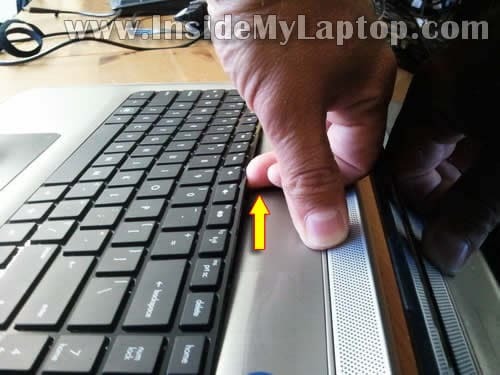 While pushing on the back side of the keyboard you’ll see the front side of the keyboard will lift up a little bit. You’ll be able to insert your fingers between the keyboard and top cover assembly and lift it up. Continue removing the keyboard and move it towards the screen. Now you can access the keyboard cable connector. 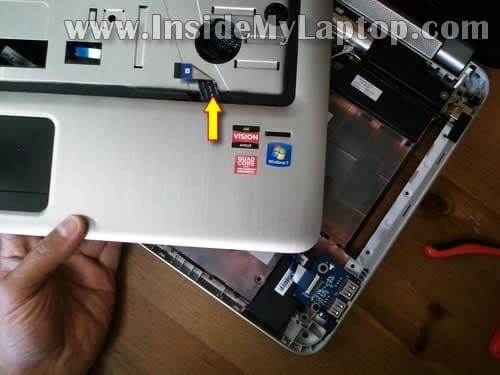 It’s necessary to unlock the connector in order to release the keyboard cable. Carefully lift up the outer side of the retainer. It will pop up at a 90 degree angle. After the connector unlocked you can pull the cable and remove the keyboard. Remove all marked screws from the bottom. Make notes about removes crews, they have different length. Remove two screws securing the palmrest assembly. – Finger scanning device cable. All cables have similar connectors. First, lift up the cable retainer. Second, pull cable from the connector. Now you can start removing the palmrest assembly. I’m using the guitar pick to separate the palmrest assembly from the bottom cover. You can use a piece of plastic. Insert it between the palmrest and bottom cover and slowly move along the side. Lift up the palmrest assembly BUT BE CAREFUL. You’ll have to slide the USB board cable through the opening. 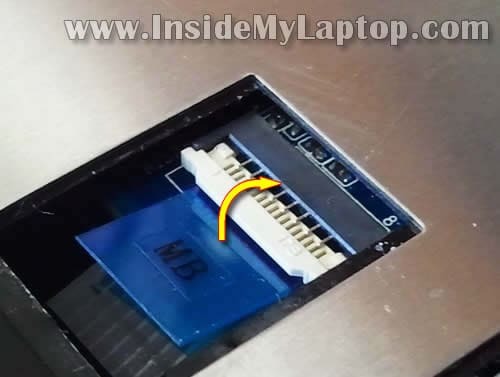 Carefully pull the USB board through the opening and remove the palmrest assembly. When the palmrest assembly removed you can get access to the DC power jack which is mounted in the uppder right corner of the base. Also, under the palmrest assembly you can get limited access to the cooling fan. It should be good enough for cleaning (in a case of laptop overheating). In order to remove and replace the cooling fan it’s necessary to remove the whole motherboard. First HP Pavilion dv7 disassembly guide (made for dv7-1000 series). Second HP Pavilion dv7 disassembly guide (made for dv7-4000 series). Fourth HP Pavilion dv7 disassembly guide (made for dv7-2000 and dv7-3000 series). 2) I boot up again and I see a normal screen FULL screen perfect But I still do not see any DOS boot up messages. This happens 50% of the time. Sometimes in very rare cases I am seeing the screen split into 4 and in each split screen I’m able to see the entire desktop but smaller. 3) If I connect an external monitor I’m able to see the DOS boot up messages and everything seems ok in my external monitor. Please let me know what could be possibly wrong with my laptop ? Sometimes in very rare cases I am seeing the screen split into 4 and in each split screen I’m able to see the entire desktop but smaller. Probably this is LCD screen failure. I think you’ll have to replace the screen. Thanks. 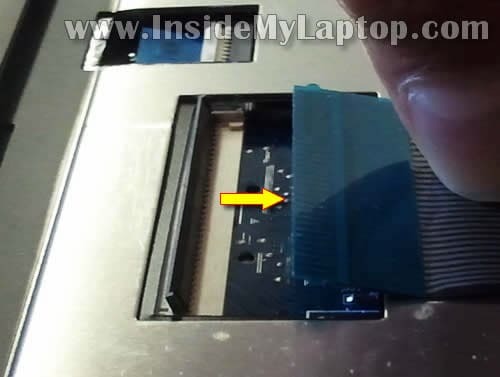 Is it the entire laptop screen that I need to replace or only the lcd screen invertor ? about 50% of the everything works just perfect, full screen etc. But in no case I’m able to see the DOS boot up messages ? about 50% of the time, everything works just perfect, full screen etc. Thanks for having the patience to put this guide together and publish it. I hesitated to prop up the HD access door, I’m used to removing the screws to do that, and then I saw the picks you took. So, I went ahead and did it. have you had nc6320 compaq or is there info in book. or is there info posted to read.i am new to sites and computers.i hop am at the right spot for this and i can even send and yo receive too. sure im a desk top monoter and computer runs. on the nc 6320 then is in the very right edge an extra key appears inbeded in cover . this is to the right of pad area. could you name or identify and what is its function. 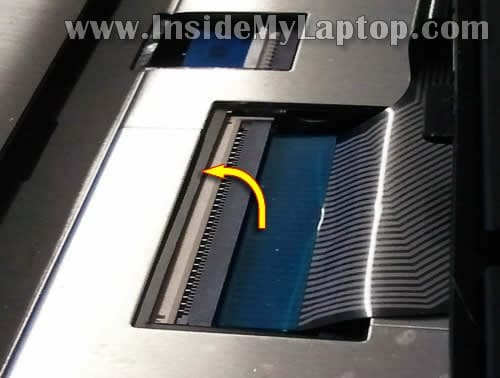 sure my labtop screen is dark but is there a posibility of it being turned off or the inverter being turned off at the input only. i would like to only test the input…. to ….onlyhow many input wires have a voltage and are run through key switches ect or hinde ect.. how many are grounds… as i stated i only consern with with input at this time..is the inverter 5v or 12 ect. have you had nc6320 compaq or is there info in book. Here’s the official service manual for HP nc6320 notebook. And here’s one of my guides: How to remove the display panel. I have a dv7-6000 that looks exactly like this. I’m trying to replace the keyboard. 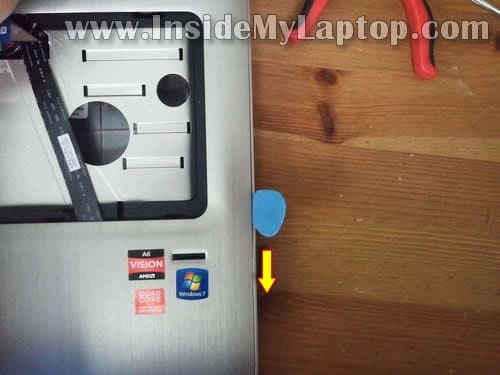 However, when I push a thin screwdriver through the screw hole, the keyboard bulges but the back edge does not come up. As a matter of fact, no edges come up, and I am not able to get any finger or anything under the keyboard to lift it up. Is there another trick to this? Or is there another screw holding this in? 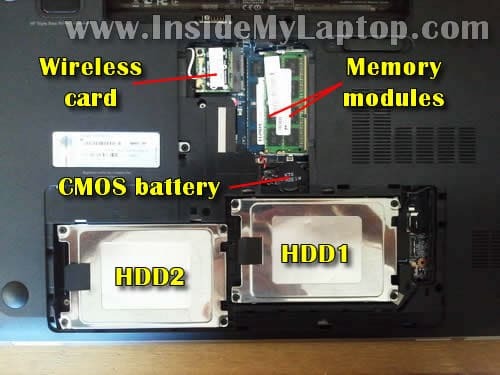 Do I need to remove the hard drives to get the keyboard out? It seems to me that the HD’s are totally irrelevant to getting the keyboard out. *Thanks a lot* for your guide, the trick with lifting the keyboard made my day – I was previously staring at the machine wondering how come it doesn’t come apart. I’d appreciate if you could note one thing in the guide: HP doesn’t care to bevel the sharp edges of the metal parts, in particular of the palm rest cover. Which means that if you use your fingertips instead of a tool (you chose a guitar pick) to lift the palm rest (steps 19 and 20), then you risk very much to slit your fingertips. I like your detailed instructions on how to open a HP DV7 lap top. 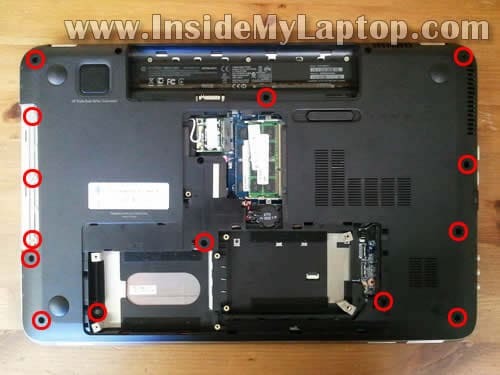 I have a hard time finding the parts to repair my HP laptop model DV7-4290us. The issue is about the left hinge (below the screen) got dislocated and the screen is tilting. I looks like it has lost the housing mechanism (a screw I guess). Right side is perfect. Laptop works fine, so I have to either forget the issue and use it with a USB docking station or repair it. With a docking statation I lose the portability altother. I am sure bottom cover (What do you exactly call it? ), the palm rest, the missing screw(s), and perhaps the the hinge need to be replaced. My question is how do I find the exact parts for DV7-4200us? HP website doesn’t have any link on this issue. Who are the suppliers of such parts? I would be most grateful to you if you could point me in the right direction. I followed this guide to try and clean out my laptop and found it very helpful. Opened and close no problem. But now my laptop is having problems it didn’t have before I opened it. Namely, it’s lagging. Programs will “get stuck” so to speak. Websites won’t load, videos stop both audio and video. Everything sits for maybe half a minute, and then starts again all at once with any tasks completed. Anyone know what might have caused this? I have a dv7 with 17.3 screen like this tutorial however I need the directions to this task and it looks like you do not cover it in this but do with a similar computer but exactly on a previous one. can you direct me as to how to locate the beginning ? Hi there. I wrote you a couple times and can’t locate my posts. I know it was in one of the dv7 articles you wrote. So, I apologize for duplicating my questions. I don’t know if I need to come back here to your site to read the response, or if it will come into my mailbox when you reply. So, at the risk of annoying you (and I apologize) I am going to ask again. I have a dv7 NON HD screen on one of my DV7’s, I was sent by mistake an HD LCD panel. Can I put that HD panel on my non-HD version? Yes, it is the matte screen, and the screen that is on the laptop is a glossy finish. Do I need an inverter too? I looked in the box and there is no inverter. I am assuming you would need an ‘HD’ inverter for it to work? OR does that have nothing to do with it. I can’t imagine it working because if I remember correctly, within the laptop itself you can adjust the resolution (somewhere?) and you wont be able to adjust it to 1080 resolution on this ‘non’ HD version. I sure would appreciate a response.. I have a dv7 NON HD screen on one of my DV7′s, I was sent by mistake an HD LCD panel. Probably not. Mose likely the HD screen needs a special video cable. It depends on the type of screen installed in your laptop. 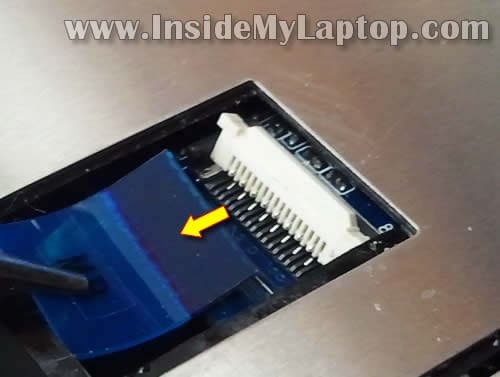 LED-backlit LCD screens do not need the inverter board. The inverter board is used with older CCFL LCD screen. But you don’t need to replace the inverter if you are replacing the screen. Now, can I buy a special video cable so that I can use the HD screen that’s replacing the non HD screen? If I can buy a cable, where besides ebay, would you recommend I purchase? With your experience, do you think this will work? Or could there be any other issues that it would NOT work? I sure do appreciate your help. Can you give me the full laptop model number and your new HD screen model number? I’ll try to figure out if you can use this screen at all. Hi! I have a HP pavillion dv7 6000 series. I’ve got some leaking in my roof, and I got home today and there was some liquid over my keyboard. Now everything works fine, but the keyboard.. ;( I disassembled it and removed the keyboard to try drying it out with the hair dryer, but doesnt seem to work at all.. If you would take a guess, what could a short circuit in the keyboard have burned in the motherboard, or do you have some other guess? Thanx so much for the help! ps. : I bought it in the US, but I live in Brazil, so, no warranties..
Just wanted to say thank you so much for posting this. This was the hardest laptop I’ve had to disassemble yet, and I couldn’t have done it without your guide. All this, just to clean the fan. I have a HP pavillion dv7 6000 series. I’ve got some leaking in my roof, and I got home today and there was some liquid over my keyboard. Now everything works fine, but the keyboard.. ;( I disassembled it and removed the keyboard to try drying it out with the hair dryer, but doesnt seem to work at all.. If you would take a guess, what could a short circuit in the keyboard have burned in the motherboard, or do you have some other guess? This could be just a bad keyboard. 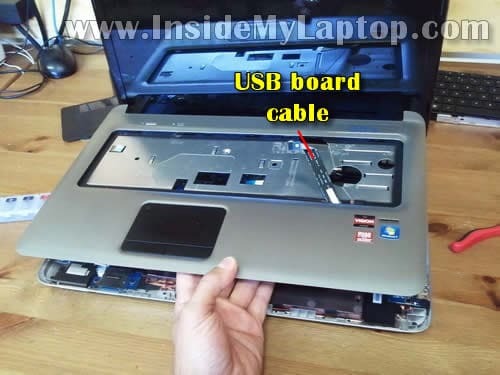 If your laptop works fine with an external USB keyboard, most likely replacing the keyboard will fix the issue. Hello, I have the HP DV7 6050ca (It’s just like this one), however my cooling fan doesn’t turn on. It sometimes kind of twitches, but otherwise it doesn’t turn on. I’ve tried playing around with the power cable for the fan and it twitches when I plug it in, but still doesn’t work. My laptop overheats all the time because of this. I’ve already tried cooling pads, using compressed air etc.But the fan mover smoothly when I turned it manually to make sure that it wasn’t stuck. So is there something I’m missing? I really don’t want to have to replace the fan! Hi, thank you for the clear instructions. I have an hp dv7t-6000 which appears to be very close to what you have in Guide 3 (laptop is about 18 months old). 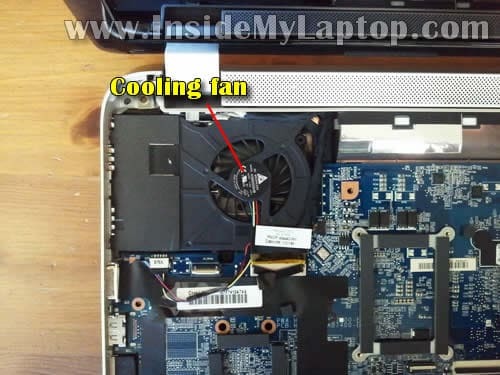 I get an error on my laptop that says the fan is not working correctly when I power it up (System Fan 90B). All of the external vents are clean and I don’t see signs of very much dust at all on the inside of the vents. This week, the fan was going on and off every few seconds, much more rapidly than it has done before. I did a hard reset today on the laptop and the fan doesn’t come on at all so I have shut off the laptop to prevent damage. Do you know how I can troubleshoot to know if the fan needs replaced or if the problem is the sensor or signal that is sent to the fan to turn it on and off. Thanks for your help! Do you know how I can troubleshoot to know if the fan needs replaced or if the problem is the sensor or signal that is sent to the fan to turn it on and off. The only way is replacing the fan. If the problem still there most likely this is motherboard related failure. I hope a new fan will fix it. First of all, thanks for the great guide and the link to the HP service manual. I´d like to hear some tips on what to do with my Pavilion DV76165 because, apparently, I screwed up. I disassembled it because the connector pin in the HDMI port bent and when I put it back together with the help of my uncle (who is an IT guy) it didn´t recognize the fingerprint pad and the screen was all blurry; where it should´ve shown white it showed fuzzy green and pink colors. It´s not an issue with the graphics card because it showed a perfect image when we connected the laptop to a screen. We disassembled it again but after this time, it doesn´t want to turn on at all. It was working perfectly before disassembling it, any idea why could this be??? Please help, I´m desperate! Thanks for taking the time to create and post this excellent guide that is the first non-video that I was able to find for the model I have (6197ca). Video is great but can’t give the detail that you have offered here, especially about minding the placement of the screws that are removed in Step 17, as this could be a real disaster, and the location of the keyboard removal screw and procedure. I have had problems with overheating and understand that the problem was due to dirt build-up, so I was looking for a resource to be able to do it myself in the future. I had this done under warranty from HP, along with the replacement of the lower case that broke at one of the speakers. 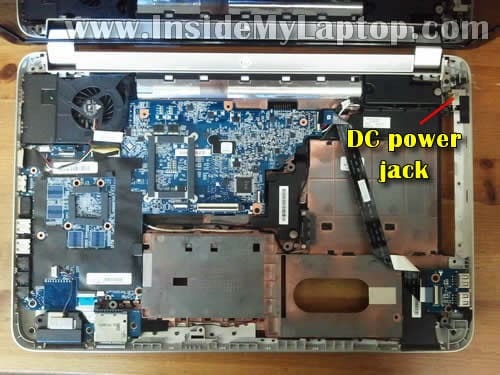 A word of caution to anyone who has warranty work done by HP – be sure that you have a working disk image before sending your computer in for “factory” service, as the buffoons there formatted my C drive while performing non-hard (purely mechanical) problems. Worse news is that the imaging software I had may or may not be able to get it back. There can be an issue about voiding your warranty by changing the hard drive, but if I were to do it again, I would have sent them a “sacrificial lamb” hard drive – keeping the original safe and sound at home – and saved myself the days of research and reinstallation that I have spent – and will spend – to get it back to working order. On that note, your guide makes it clear which is the C drive – and would have made this switch very easy. Just finished taking apart my DV6100…and it worked like a charm. 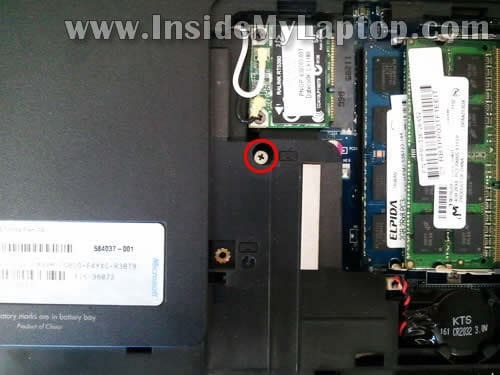 I noticed in step 17, there’s one screw which is not circled…located below the primary hard drive. You’ll want to take this one out before lifting up the palm rest / touch pad. Also, be careful of the clips. Somehow the clip holding the power cable ribbon broke off. Be careful while removing the ribbons in step 15. If you have larger fingers /hands like me, you might also want to find someone with smaller fingers to assist. Thanks for the post!! Cleaned out my fan and replaced a keyboard (due to a broken up arrow)! Hey! Thanks for a great gudie! Is there anyway i can acces the fan whitout haveing to take apart the keyboard and all that? In the 6000 series, does anyone have the P/N for the fan unit? Mine has gone bad, and I desperately need to replace it, but I made the mistake of ordering the wrong ones before. I am having problem with my screen flickering (sometimes so bad i cannot see anything on it!) I have used your other guide to removing and replacing the screen, which was perfect in itself, but the new replacement screen is having the same problem. Any help would be greatly appreciated, it is driving me slowly insane! 3. Could be motherboard related failure but most likely it’s either 1 or 2. Does it flicker when you move the display back and forth? If yes, probably it’s bad cable. I would try reseating the video cable first and if it doesn’t help, replacing the cable. Thanks for your quick reply! I have, on a fair few occasions, had this laptop plugged into my TV (with a HDMI cable) and i have had no problems with this. It also does sometimes flicker when moved, though i often have to move it to stop it flickering. I do think resetting the video cable would do the job, but i am unaware of how to do this. Do you have any guide of how to access this? It has been doing this since i replaced the screen, so i do not think the connection is bad at this end, but i do not know how to access the motherboard. I do think resetting the video cable would do the job, but i am unaware of how to do this. Do you have any guide of how to access this? The video cable plugged into the motherboard under the top cover (palmrest assembly). 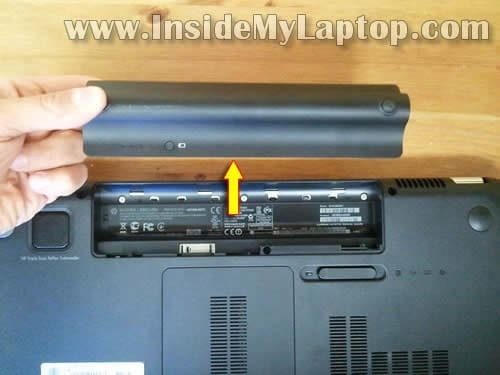 It’s necessary to remove the top cover as it shown on the las picture in this guide. After that you’ll be able to unplug the video cable and plug it back in. It also does sometimes flicker when moved, though i often have to move it to stop it flickering. This sounds like video cable related issue. I doubt that reseating the cable would be enough to fix the problem. Most likely you’ll have to replace the cable completely. To do that you’ll have to disassemble the display panel and remove the LCD screen. Also, you’ll have to remove the top cover assembly. Below the fan. Look at the last picture. 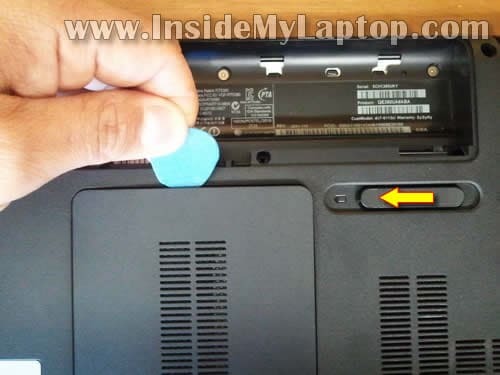 You never said to unscrew the touchpad screw and I almost broke it! Love this guide though. You are a life saver. Black screen of death, doesn’t recognize the battery & the power button doesn’t work MOST of the time. This started when it was still under warranty, but I couldn’t get it powered on to remove all of my private photos. I thought that I had purchased the extended warranty when I bought it on amazon, but now looking back through my email I used at the time it’s a big confusion. I had actually picked out, paid & selected the extended warranty on a different laptop on amazon … Only to be notified a week and half later that it was no longer available. So that extended warranty had to be cancelled. On my amazon history it doesn’t look like I added it again …which if can’t believe. I need to contact amazon to be sure … Otherwise, I’ll need to repair it myself! Is it possible for you to post the instructions? I am technically savvy …even though I’m a girl!! I have a dv7-6179 and was wondering how difficult it would be for me to replace the power button myself? The power button mounted to the bottom side of the top case. You’ll have to go though disassembly steps 1-23. You can see the power button shown on the picture in the step 23 (upper right corner). 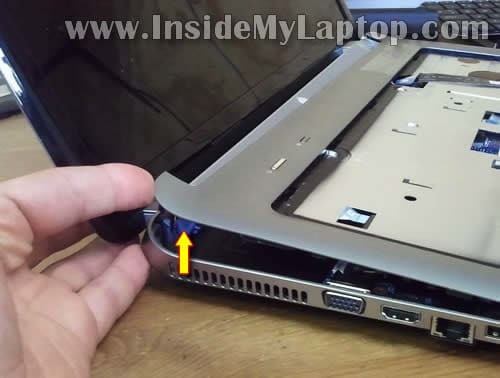 After you remove the top case, it should be very easy to replace the power button board. You can buy a new power button board on eBay, just search for “dv7-6000 power button”. Killer tut, thank you just repaired the fan to my 4063 model laptop. Minor differences but got the job done. thank you, finally a detailed guide for the dv7-6xxx! One further note on step 17 – the longer screws have a small diamond next to the screw hole while the shorter ones do not. Damn keyboard HP DV7 6c60us and it will not come off. This is the closest guide and the screw it out. I gently tried to push up with a screw driver but short of putting the screwdriver THROUGH the keyboard, I just stopped and tried to use a pair of tiny flatblades. All screws are out and it refuses to come up. Whoever designed this needs a hard slap. Did you remove the optical drive screw? I believe this screw also secures the keyboard. I get a message thatmy 99B fan is broken and may csuse.damage to the processor. It seems ineed to replace the fan. Can you please upload a fan installation for the dv7 6143 series. I don’t.want to proceed without a guide on how to remove the fan unit. Is it possible to replace the fan without removing the motherboard? This guide helped me swap out my jack for my dv7. No issues, all the cables accounted for. Installation went perfectly thanks to this guide. Thank you! YOUR INSTRUCTIONS ARE FANNNNNNTTTTAAAASSSTTTIICCC! 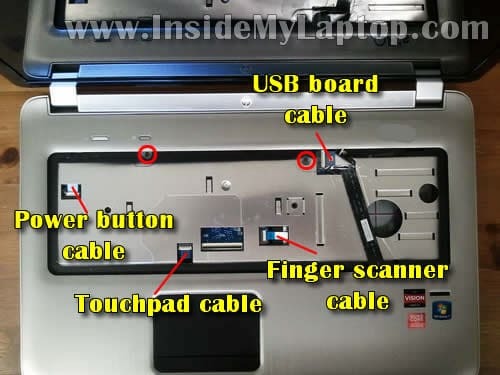 I ran into the roadblock on how to remove the keyboard and disconnect the keyboard cable. Two frustrating steps that you described and pictured just what I needed. I was so afraid of breaking things but you gave me what other experts skipped over or gave vague instructions. Thank you ! HP needs to construct these machines better! They are not user friendly on somethings that should be. If they purposely made these to be difficult then someone needs to slap the engineers twice. According to the service manual for this model, the USB board cable included in the cable kit. The cable kit part number is 639402-001. I searched on eBay and found one for $35.95 with free shipping. Try to research this part number. Maybe you can find a cheaper one. Definitely put me on the right track for taking it apart nicely. 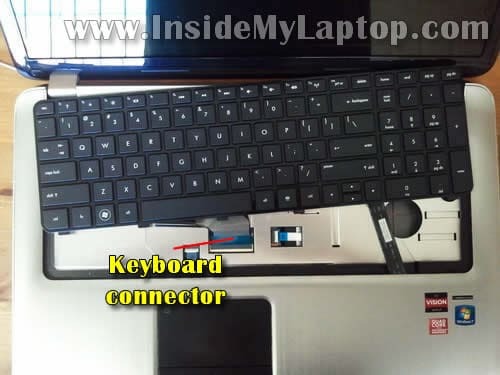 Great Instructions Needed to replace the keyboard on an HP dv7-6187cl laptop. I removed battery, then back cover and followed steps 10 to 17 only to remove keyboard and reversed to install the new one. Only 1 screw to remove and put back in. I was very cautious but once you’ve done it you could repeat the process in about 15 minutes at the most. My replacement keyboard cost $27.50 and that was because had to be shipped from China. Kudos on a great site. Thanks for this post. It is a great guide easy to follow and super helpful. Couldn’t have done it with out this guide. I don’t know much about computers but your instructions made it really easy for me. Only problem I had was the keyboard ribbon locking clip came off in my hand when I tried to open it. BE DELICATE with it as I suspect it was designed to break to get you to pay for a new motherboard. I was able to salvage mine with some tape, after I put it all back together and realized it did not work. Second time only took me 5 min! Awesome job thanks. I have a dv7-6143-cl laptop. I need to replace the fan. According to your instructions I need to remove the motherboard. I just hope the mother board isn’t welded to the case. Also, would you happen to know the part number for the fan, I looked and I couldn’t find it, it must be on the bottom which I haven’t removed yet? When I start up my laptop I get a 99B fan error, indicating it’s not working. I’ved opened the laptop up and used a air can blower, but nothing came out and it still didn’t fix the problem. Replacement is my only other option. I just hope the mother board isn’t welded to the case. No, it’s not welded. You can remove it. Search on eBay for dv7-7143cp fan an you will find it. It’s about $10. I believe HP part number is 650797-001. 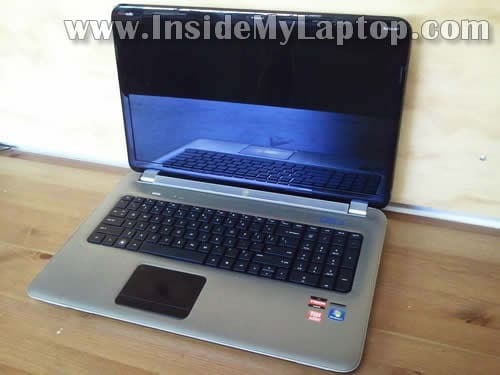 Mine Laptop is HP DV7-6000 which i brought from Japan. Do you know where can i buy the thermal pads for cpu, gpu and capacitors?